Half Up Crown Braid is the half up version of the Dutch crown braid. I recently posted a new version with a flower crown which is the same technique but minus the flower crown. I love this hairstyle because I absolutely love wearing a crown braid. It always seems to be the perfect hairstyle for combating the summer heat. I wore it a few times on our trip to Bear Lake, which you can see here in case you missed it. Wearing this half up version was especially fun because it still feels fancy, yet casual since some of the hair is left down. It is the same technique as the crown braid tutorials above but with a slight tweak when braiding the hair at the back of the head. You will see what I mean in the video tutorial below. I hope you love it as much as I do and give it a try! Start by creating a deep side part on the right side. Next, take a section on the heavy side of the part. Divide this section into three equal pieces. 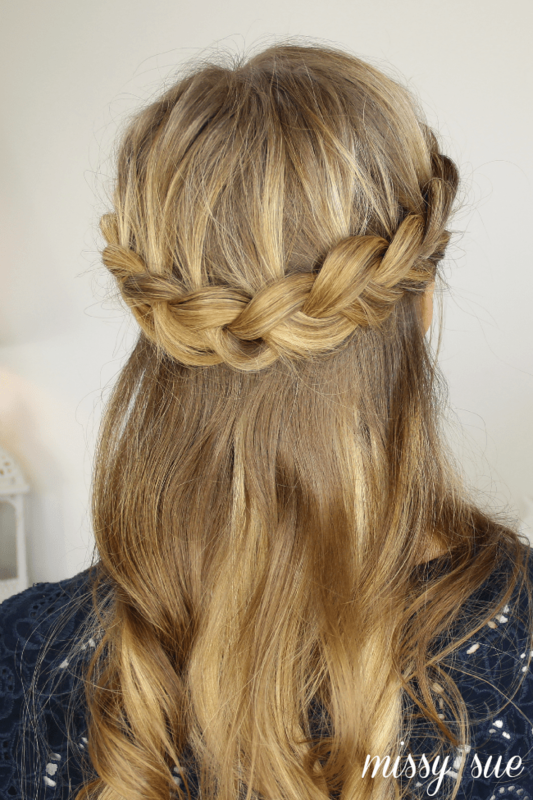 Begin a dutch braid by crossing the back strand under the middle. Then cross the front strand under the middle. Now when the back is crossed under the middle, bring in a section of hair and add it into the strand. Repeat step six with the front strand, bringing a section of hair which creates the dutch braided effect. Continue steps 6 and 7 until the braid reaches the top of the left ear. When the braid crosses around the back of the head, pull in pieces of hair, on the bottom portion, that are closer to the braid. This will make it harder to tell that hair is being brought. Add in hair from the top of the head and usual. Continue braiding around the head until all the hair in brought in and the braid reaches the right side of the head. Then braid the hair down into a regular braid. Tie off the end with an elastic. Then lay the tail right behind where the braid started and pin it down, hiding the pin underneath the braid. Finish by smoothing down any flyaways with hairspray and curling the ends of the hair. Hey Missy, I love your tutorials and get compliments on my hair all the time when I do them. I have a question about this style (which is one of my favorites). After I’ve braided around from the part to the other side of my head, I stop at my ear and braid down. When I go to put the braid over my head, it always looks too loose on the and the hair that I brought in loops weirdly. It’s hard to explain, but maybe it’ll make sense to you. Is there a way to send you a picture? Hi Emmi (: I understand what you mean. I think part of it is that the braid is held downward while braiding so when you loop it upwards it has the loose pieces hanging out. You could try holding the hair upwards towards the top of your head or forwards to finish braiding and this might help keep that side of the braid tighter <3 hope this helps! I just can’t stop looking at your hair!! Can you please also tell us some details like: how do you die/ bleach your hair, what is the colour and how do you take care of it? I was a brunette for 7 years and now, that I got rid of it, I really want to try this blonde. But in reality, I don;t know what colour to ask to the salon/ to do at home , in order to get what you have and not chicken yellow. Hi Adriana, thank you! My natural hair color is dark blonde and the highlights are a white blonde and gold blonde mix. I am sorry but that’s all I know. Hope this helps! Thank you, it does help me to know what to ask to my hairstilist!!! Oh my goodness, you did a beautiful job! SOOOO gorgeous! I really need to work on my braiding! This is amazing! Nice tutorial, you make it seem so easy :) I like your makeup too, very pretty! Gorgeous braid! I have down pat the french braid but have yet to learn the dutch. Thank you for a great tutorial!